One of the nicer fast food options is Chick-fil-A. They serve up real food, are normally very pleasant and are very clean. I haven’t always loved CFA but, I have always at least enjoyed it. In the past 3 or 4 years, I have really begun to appreciate and love it. I absolutely love the Chicken Burrito served up for breakfast and when I eat dinner there, I totally over eat. On my most recent trip to CFA, I ordered up some Nuggets along with a few other items. For the sake of this particular review, let’s just discuss the Nuggets. The Nuggies. The small pieces of yum. 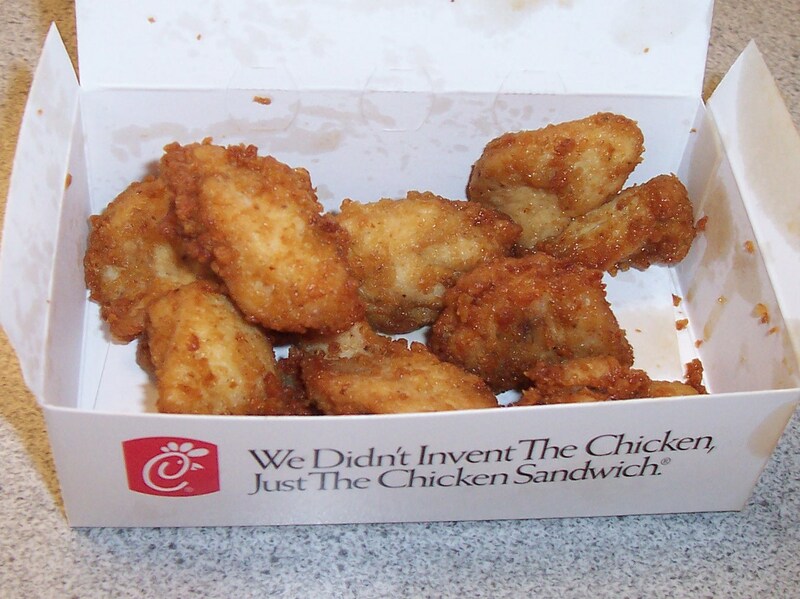 The CFA Nuggets, or Nuggies as I prefer to call them, are served in 8 and 12 packs. I normally opt for a pack of 8 and eat them in addition to the rest of my meal. The nuggets vary in size – two are never alike. This is the first thing that sets these nuggets away from other fast-food nuggets – they are not mass produced pieces of chicken-like-filling. None of that from CFA. These nuggies are 100% real chicken breast and each one is hand/machine cut. And you most certainly can tell. Each nuggie is carefully breaded and then cooked. The breading on each nuggie is there but in no way overpowering. It has a very sweet and savory flavor which compliments the chicken itself quite well. While the breading is sweet, it is more of a natural sweetness then a processed sugar sweetness. The fact that the nuggies are not overly breaded really helps present the nuggie in a sweet but not sugar like flavor (that previous sentence made no sense). The breading is not salty but rather gets its flavors from the sweetness baked right in. The quality of the chicken contained within the sweet nuggie breading, is just phenomenal. Each nuggie exhibits a juicy, flavorful interior of chicken breast. There are no ‘chewy’ pieces or dry pieces in the least. The chicken has a very natural flavor to it and is not overly salty or saturated with false flavors. I cannot stand when I eat food items and feel like I just ate a salt brick – even if the item has a lot of sodium, I should be able to taste the food. The moist chicken inside paired with the sweet breading outside, provide an overall perfect nuggie. CFA also does a great job of cooking these up just right. I have never before received nuggies that were either over or under cooked…they are always just right. I am glad that CFA is available as a fast food option. While the prices are a bit more expensive than other fast food restaurants, you are getting actual real food. CFA also has great unsweet iced tea and some of the best service you will receive anywhere. Nuggies are a staple of my large CFA meal and I can’t say that I have ever had a bad batch. Exceptional service, mixed with fabulous flavors both on the interior and exterior of each nuggie, makes CFA a no brainer. My kids hate CFA!!! I make them go once a year to dress like cows thinking maybe this will be the time they like it- never happened yet! Their grilled chicken is so tender and fresh. Maybe the fried chicken isn’t processed enough for them and the fries are too different looking. Wish I could go there more as I really enjoy it.